Theatre Trivia Tweet: Last song in Oklahoma! | All Tickets Inc.
All Tickets Inc. > Trivia > transfer > Theatre Trivia Tweet: Last song in Oklahoma! Home » Trivia » Theatre Trivia Tweet: Last song in Oklahoma! The musical Oklahoma! Ends with the celebratory anthem Oklahoma! But that was not the original final song. 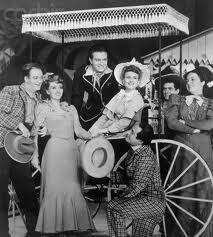 What Rodgers and Hammerstein song originally ended Oklahoma!? It was a song that eventually found its way into Carousel. That song was You’ll Never Walk Alone. In Oklahoma! it was to be sung by Aunt Eller to Laurie.